Few garden treats can top a vine-ripened tomato from your own garden. Unfortunately, there are many problems that can affect tomatoes in St. Louis gardens that can prevent you from obtaining your goal. 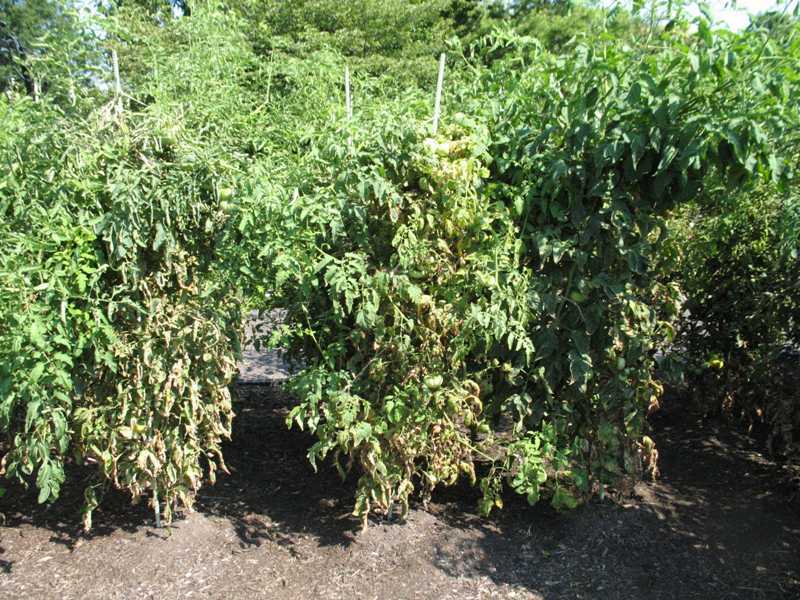 Following are some of the major tomato problems we encounter in St. Louis as brought to the Kemper Center Plant Doctors. The problems are arranged from minor problems to the most severe. 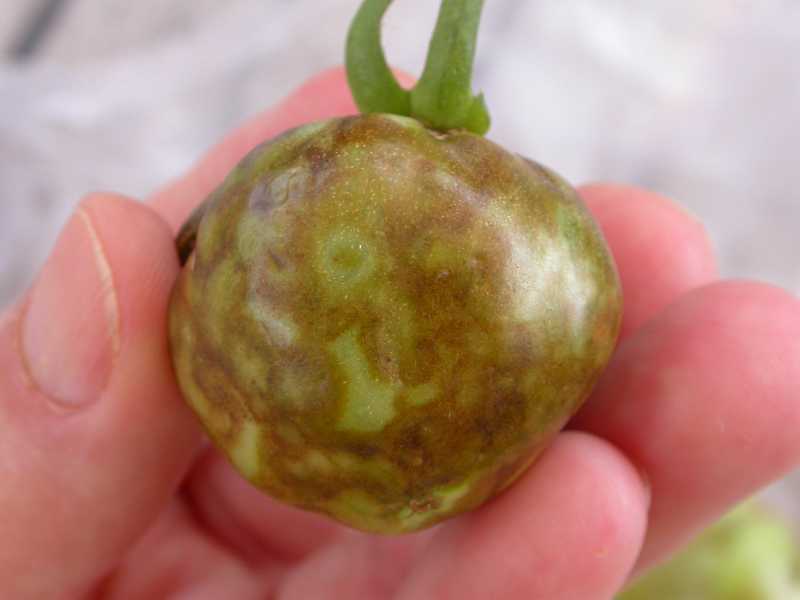 Growth cracks are common on many tomato varieties and result from the uneven growth rate of the fruit. This usually occurs after a rain, which was preceded by a dry period. 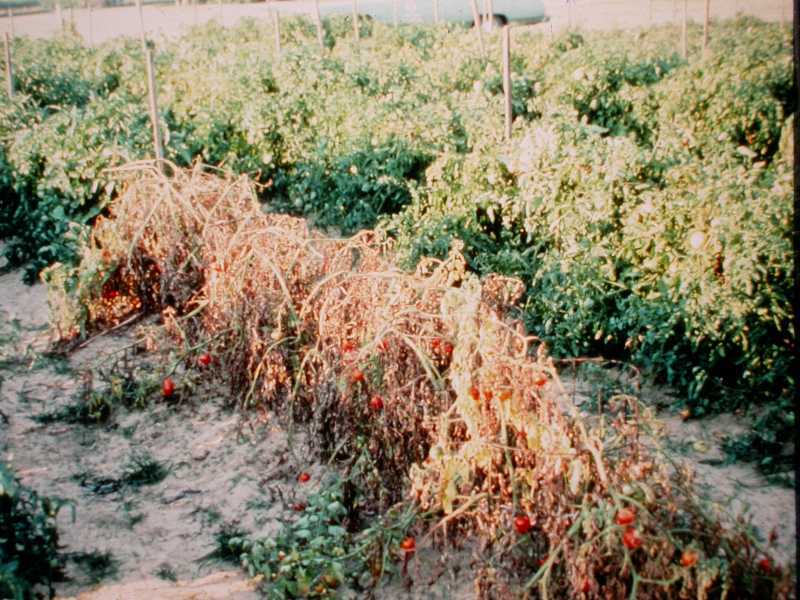 Some tomato varieties are more prone to cracking than others. The tomatoes are still good to eat. Just cut out the damaged area. Blossom-end rot is another disorder resulting from water fluctuations. 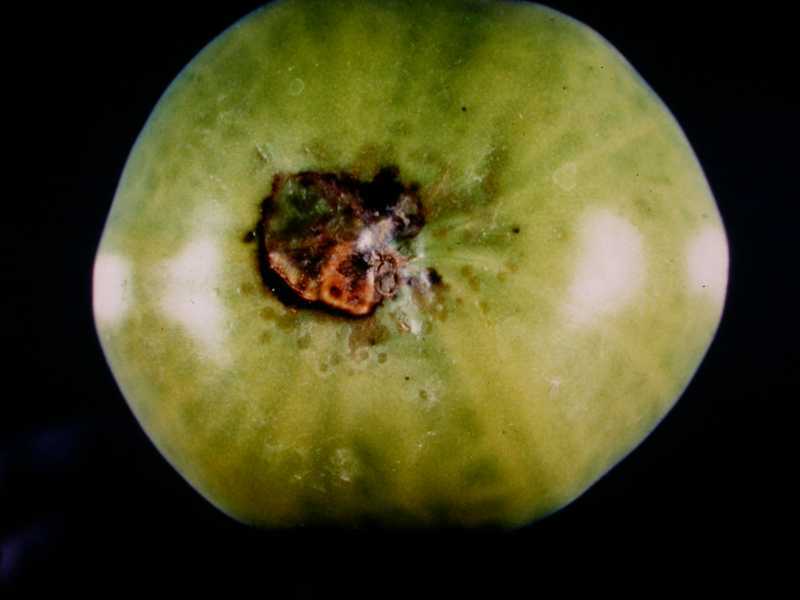 Typically, it occurs when the plant experiences drought stress after fruit has formed. Once the dry, leathery spot forms it will not go away but, if the spot is minor, the fruit may still ripen normally. Just cut out the damaged areas. If the problem is more severe, the leathery spot can split open and provide an entry point for fungi and bacteria which will rot the fruit. Control is by providing even moisture throughout the season. Mulching can help to keep the soil moisture level more even. Leaf roll is common on some tomato varieties. True leaf roll is not harmful. If all the plants of the same variety are equally affected, each plant is totally affected (not just part of the plant), and the foliage still looks green and healthy, most likely the roll is normal and not caused by spider mites or a virus disease. Be sure and rule out spider mites and viruses (see below), which could appear similar. The tomato hornworm is usually easy to spot and control before it causes much damage. If it appears as the one in this image, with white insect cocoons on it, do nothing. The hornworm has stopped feeding and beneficial parasitic wasps will emerge from the cocoons. This is mother nature at her best. Let her do her job without spraying chemicals. Spider mites are a very common problem on tomato plants in the hot, dry months of summer. We see plenty at the Plant Doctor desk. Spider mites are piercing-sucking mites that feed on the leaves causing them to first look a bit off-color and later bleached and brown. They are too often overlooked by gardeners who just report that the lower leaves on their tomatoes are turning brown and dying. Disease can also cause leaves to brown and die, but spider mites are easy to spot on close examination. Regular “washing” of the lower leaves can go a long way to helping reduce this problem. 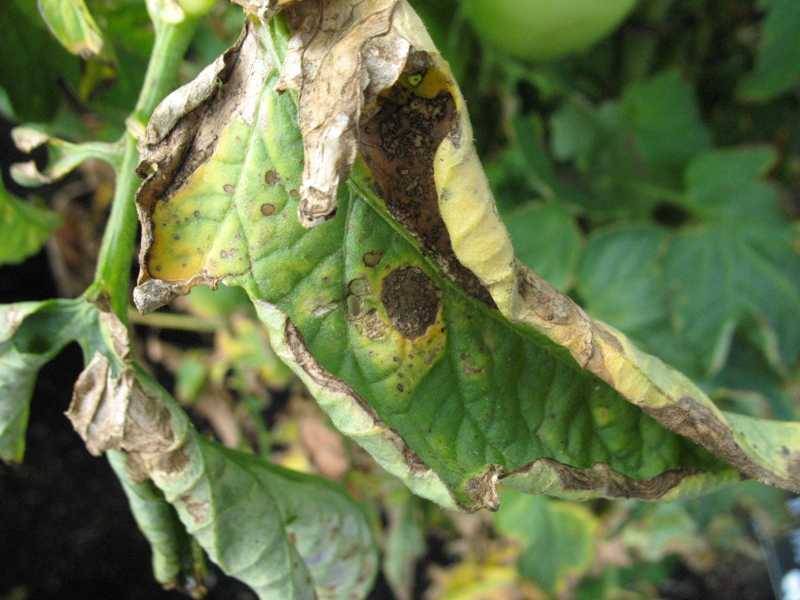 Tomato diseases can be difficult for the home gardener to identify and control. Some live in the soil for many years making crop rotation necessary. Although chemicals are available to control some of the diseases, your first line of defense should be to plant your tomatoes with plenty of space between them; 3-4 feet apart should be the minimum spacing to allow good air flow around the plants. Staking the plants can also provide better air circulation to allow foliage to dry quickly. Do not use overhead watering. Following these rules and removing leaves early that show signs of disease can reduce disease problems considerably. This said, following are a few of the major tomato diseases in our area. One of the earliest foliage diseases we see is early blight. The expanding, circular spots on the leaves are quite easy to spot with close examination. Removing an infected leaf early when it first appears can go a long way to controlling the disease without chemicals. Septoria leafspot occurs later in the summer and causes small spots on the leaves usually bordered with a purple ring. Again, collecting and disposing of early infections can reduce infection problems. Bacterial disease can affect both leaves and fruit. A spray containing copper applied as a protectant can provide some protection but it is best to avoid problems by allowing for proper spacing and removing infected leaves early. Both bacterial and fungal problems are usually more severe in damp, rainy weather. Avoid overhead watering. 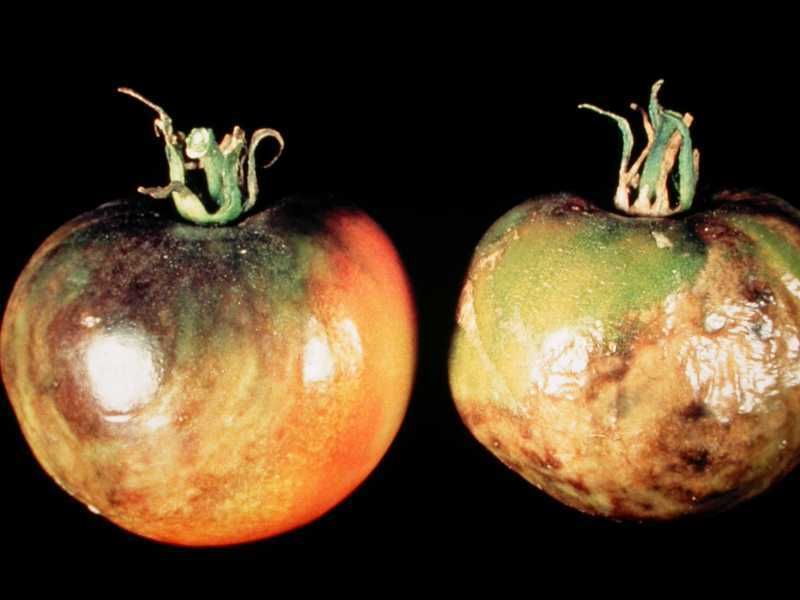 Fusarium and verticillium wilts are devastating diseases of tomatoes. They plug the vascular tissue of the plant (water conducting tissue) and result in wilting of the plants and inevitable death. Fusarium wilt is often noticed on just one side of the plant first but can quickly affect the whole plant. Removal of infected plants is required to reduce disease spread. 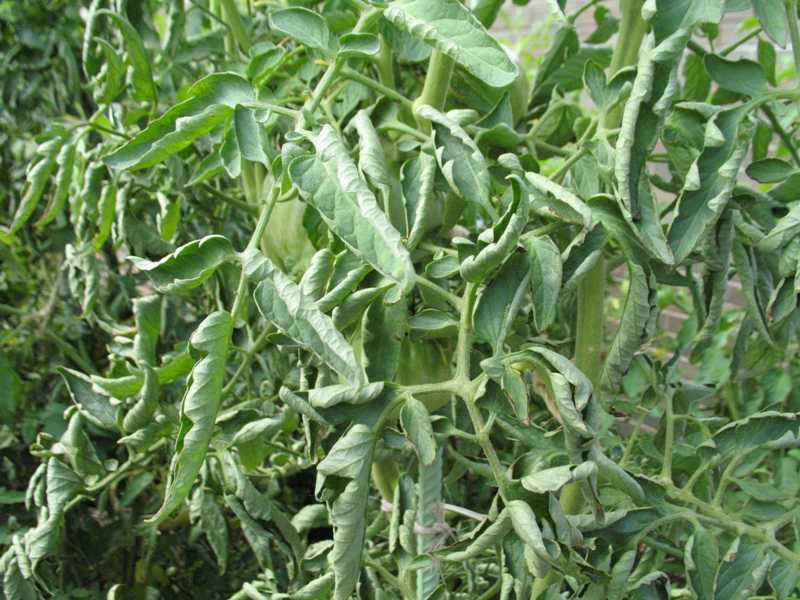 Crop rotation and selecting tomato varieties that are more resistant to the disease are the best control measures. Look for varieties that are more resistant to fusarium and verticillium wilts. This is denoted with a “F” or “V” associated with the variety name. In 2009 late blight caused extensive devastation in the Northeast but it is generally a minor disease in the St. Louis area. It occurs late in the season but can kill plants rapidly. 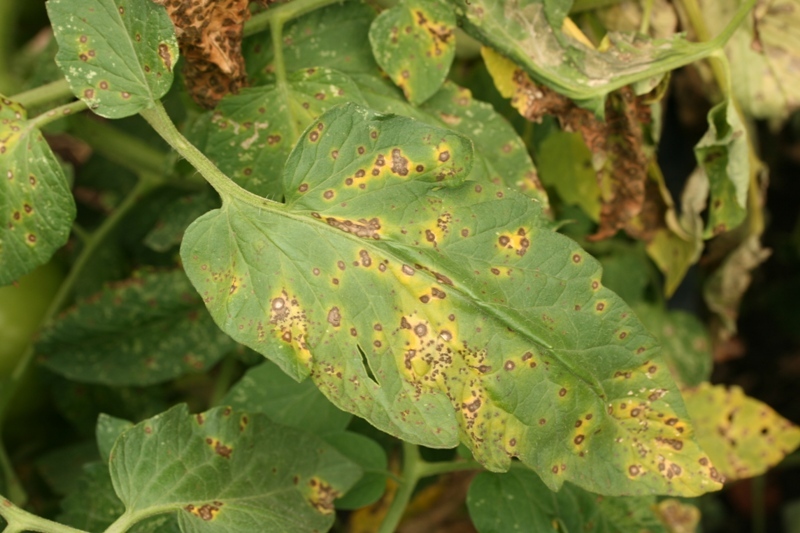 The disease begins as black, water-soaked spots on the leaves but can quickly spread and kill plants. Early removal of infected plants is recommended. 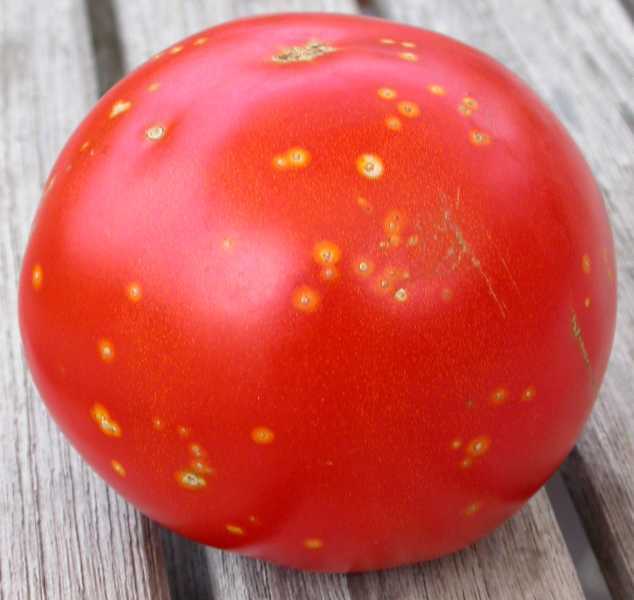 Tomatoes are susceptible to a number of virus diseases. Symptoms can be curled or string-like foliage, mosaic coloration on the foliage and fruit, or deformed plants. Remove diseased plants when noticed and look for varieties that are more resistant to the common virus diseases.